We had a strong performing display remarketing campaign and wanted to drive incremental bookings, SearchStar suggested social remarketing. We now have granular remarketing campaigns on Facebook that are delivering excellent ROI. They also suggested that adding a promo code could boost sales from the Facebook ads. Since then, we've seen a significant uplift in sales and revenue. SearchStar have done a fantastic job with our Facebook ads, proving they are experts in more than just PPC. We can't wait to get started with Twitter now too! As Scotland’s capital airport, Edinburgh Airport is one of the top ten largest airports in the UK. Car parking is one of the main revenue generating products at the airport. SearchStar has been running the PPC for car parking at Edinburgh Airport since 2013 on Google and Bing, as well as running a remarketing campaign through DoubleClick. However, there are always extra ways to expand reach and improve the conversion rate of users that have visited the site but not yet booked parking. SearchStar suggested social media remarketing as a way to reach users that had a need for airport parking but had left the site without making a booking. The first part of the solution was to set up campaigns on Facebook encouraging recent site visitors to book. However, we quickly found the conversion rate to be slightly lower than that of other marketing channels. In order to increase conversion we suggested running a four-week promotion offering a discount on any parking booked through Facebook, to incentivise users that had previously visited the site but left without booking. One of the most common reasons for not booking straight away is that the user is looking to compare prices and make sure that they’re getting the best deal – so we thought it would be interesting to test a price incentive in the remarketing ads. 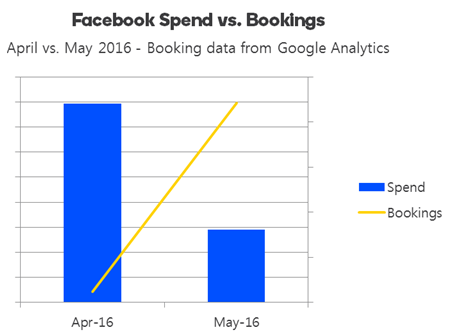 With the introduction of a promo code, 5% less budget was spent while delivering a 1741% increase in bookings. Facebook is now a much more significant contributor to total monthly sales and revenue for the car park. Using a promotion code for social remarketing really does have a huge impact on conversions, something to consider if your product is price sensitive and you’re struggling to convert returning users!